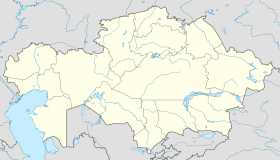 Pavlodar (Kazakh an Roushie: Павлодар) is a ceety in northeastren Kazakhstan an the caipital o Pavlodar Province. It is locatit 450 km northeast o the naitional caipital Astana, an 405 km sootheast o the Roushie ceety o Omsk alang the Irtysh River. As o 2010[update], the ceety haes a population o 331710. The population o Pavlodar is componit predominantly o ethnic Roushies an Kazakhs wi significant Ukrainian, German an Tatar minorities. The ceety is servit bi Pavlodar Airport. Ane o the auldest ceeties in northren Kazakhstan, Pavlodar wis foondit in 1720 as Koryakovsky, an Imperial Roushie ootpost. The dounset wis creatit tae establish control ower the region's salt lochs, an important soorce o valuable salt. In 1861 the dounset wis renamit Pavlodar an incorporatit as a toun. Pavlodar's significance wis due in lairge measur tae the substantial agricultural an salt-producin industries that haed developit thare despite the toun's relatively smaw population. Pavlodar's population numbered anerly aboot 8,000 in 1897. The name Pavlodar signifees The Gift o Paul, an wis chosen tae commemorate the birth o the Grand Duke Paul Alexandrovich o Roushie. Efter 1955, the Soviet Govrenment's Virgin Lands Campaign providit the impetus for the rapid growthe an development o modren Pavlodar. As pairt o the program, lairge nummers o young men an weemen frae throuoot the Soviet Union settled in the ceety, rapid industrial an commercial expansion follaeed. Frae the mid-1960s on, Pavlodar grew tae acome a major industrial centre o baith the Kazakh SSR an o the Soviet Union; the lairgest local industries are the manufactur o ferm machinery, aluminum, an industrial chemicals; an ile refinery wis completit in 1978. Acause o a major airms an armour manufacturin facility locatit in the ceety, Pavlodar wis closed tae foreigners till 1992. Pavlodar haes a temperate continental climate wi lang, cauld winters an het simmers. The average temperatur in Januar is −15.8 °C (4 °F) wi absolute observit laws reachin −45 °C (−49 °F) tae −47 °C (−53 °F). In Julie the temperatur averages 21.5 °C (71 °F). Yearly precipitation amoonts tae 303 mm (12 in). The ceety's population is 331,119 (as o 1 Januar 2012), an the extendit urbanisit aurie haes 342,321 indwallers. In 2012 Pols rollin stock manufacturer Pesa Bydgoszcz annooncit its intentions tae big a tram assembly plant in Pavlodar, in conjunction wi the ceety's plans tae buy up tae 100 new trams frae the manufacturer tae shore up its agin public transport infrastructur. FC Irtysh is a Kazakh fitbaa club based at the Tsentralny Stadium in Pavlodar. Anither notable club formerly based in Pavlodar, FC Energetik, haes syne relocatit tae Ekibastuz. The Chess Federation o Pavlodar organises frequent ceety-wide competitions sic as «Pavlodar Open 2007» an «The Pavlodar Regional Cup», a fast chess competeetion. Several FIDE masters, an grandmasters includin Rinat Zhumabayev, Pavel Kotsur, Yuri Nikitin Vladimir Grebenshikov, an Yelena Ankudinova, pairticipate regularly in the events. Pavlodar haes an 86 km streetcar (tram) netwirk, which began service in 1965 wi, as o 2012, 20 regular an 3 special routes. The netwirk haes a 60% share o the local public transport mercat. Housomeivver its fleet o 115 trams are due tae be replacit. In 2012 the ceety annooncit plans tae purchase 100 new trams in conjunction wi the construction o a new tram factory bi Pols manufacturer PESA SA. In addeetion, Pavlodar haes bus an minibus (marshrutka) service. ↑ —Погода и Климат. Retrieved 19 December 2012.